On TNT’s Falling Skies TV series, Tom Mason (Noah Wylie) and the rest of the 2nd Mass continue to fight off the alien invasion. Will they succeed? Will the show draw solid ratings for TNT so that they can keep on fighting? A high-action sci-fi drama, the show’s ensemble cast also includes Moon Bloodgood, Drew Roy, Jessy Schram, Maxim Knight, Seychelle Gabriel, Peter Shinkoda, Mpho Koaho, Sarah Carter, Colin Cunningham, Connor Jessup, and Will Patton. The TV show ratings are the best way to tell if Falling Skies will be cancelled or renewed for a third season. 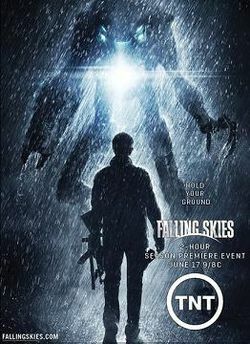 The second season of TNT’s Falling Skies airs Sunday nights. There are 10 episodes. Final season averages: 1.3 rating in the 18-49 demographic with 3.75 million total viewers. 1.4 demo rating (+8% change) with 3.84 million (+11% change). Season averages: 1.31 in the demo with 3.75 million. 1.3 demo rating (0% change) with 3.46 million (+4% change). Season averages: 1.30 in the demo with 3.73 million. 1.3 demo rating (+8% change) with 3.34 million (-3% change). Season averages: 1.30 in the demo with 3.77 million. 1.2 demo rating (0% change) with 3.45 million (-4% change). Season averages: 1.30 in the demo with 3.83 million. 1.2 demo rating (0% change) with 3.61 million (-1% change). UPDATE: Falling Skies has been renewed for a third season by TNT. 1.2 demo rating (0% change) with 3.64 million (+7% change). Season averages: 1.34 in the demo with 3.95 million. 1.2 demo rating (-11% change) with 3.39 million (-11% change). Season averages: 1.38 in the demo with 4.03 million. 1.3 demo rating (-13% change) with 3.81 million (-15% change). Season averages: 1.50 in the demo with 4.46 million. 1.5 rating in the 18-49 demographic with 4.46 million total viewers. Reference point: The first season of Falling Skies averaged a 1.6 rating in the 18-49 demographic with 4.70 million total viewers. It was renewed for a second season in July 2011 after four episodes had aired. What do you think? Do you like the Falling Skies TV series? Do you think that it should be cancelled or renewed for season three? I really love the show a lot,really enjoy the show too.cant wait until it come on again,want to see my show again?Thanks,your Fan……. Glad this show has been renewed for another season! Great show! Jenn » You’re correct. We reported the renewal back in July but I forgot to note it here. Thanks for the comment! I love, love, love this show. Please renew for season 3!!!!!!!!!!! Absolutely renew! I’m hooked on skitters. I really like this show. There is an equality between men and women which is very appealing as well as unusual. Even the younger ‘survivors’ participate in ways that shows they are protected but important members of the team. Love the twists and turns in the plot. Find myself screaming “turn around” and “don’t trust her” at the TV. Great writing and acting. The Peoples Republic of MASS fighting aliens? The Eastern Seaboard version of France? Collaborators yes. Fighters no. That’s not sci-fi….that’s fantasy! Renew,Renew,Renew Falling Skies for a 3rd Season! I Love This Show! I love falling skies and defintely think it should be renewed. The story telling is fantastic, and the show is very emotional also. I really can’t wait to see the mason family grow and find out whats in store for the 2nd mass. Nonetheless a very entertaining show to say the least.